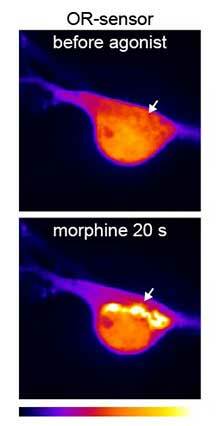 ​Fluorescence micrograph of a neuronal cell body showing the location of opioid receptor activation detected by the new biosensor immediately before (left panel) and 20 seconds after (right panel) application of morphine. Arrow points to the Golgi apparatus, a location within the interior of the cell body at which receptors are activated by morphine (as well as a number of other non-peptide opioid drugs) but not by peptide ligands. Drs. Miriam Stoeber and Damien Jullié. NIDA. "Study upends conventional view of opioid mechanism of action." National Institute on Drug Abuse, 10 May. 2018, https://www.drugabuse.gov/news-events/news-releases/2018/05/study-upends-conventional-view-opioid-mechanism-action. NIDA. Study upends conventional view of opioid mechanism of action. National Institute on Drug Abuse website. https://www.drugabuse.gov/news-events/news-releases/2018/05/study-upends-conventional-view-opioid-mechanism-action. May 10, 2018.